How well do you see the world around you? With UltraHealth take your life back and see in a new way filled with clarity and all-day comfort. No more lenses popping out. No more irritating dirt. Now, you too can Reclaim Your World with UltraHealth hybrid contact lenses. UltraHealth is the only irregular cornea hybrid contact lens with highly breathable, healthy materials and an advanced lens design especially suited for patients with irregular cornea conditions. UltraHealth corrects vision problems, is healthy for your eyes and delivers exceptional comfort, too. 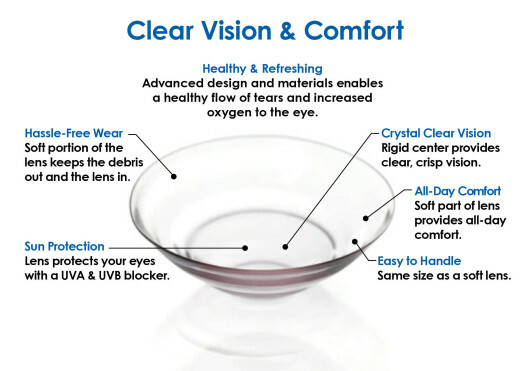 UltraHealth offers a combination of vision and comfort benefits only available in hybrid contact lenses. The “rigid” (GP) material optimizes vision; while the soft skirt centers the lens over the cornea, providing enhanced clarity and longer-lasting comfort. UltraHealth is the same size as a soft lens, making it easy to handle, while the soft portion of the lens keeps dirt and debris out and the lens in. UltraHealth is made with materials that allow high oxygen transmission. The lens design promotes tear circulation throughout the day, allowing for all-day wear. And the lens protects your eyes with a UVA & UVB blocker.